So one of my mother-in-law’s absolute favorite things that I make is a vegetable ratatouille. I rarely make one at home, but it’s become a staple when having family dinners at her house. Well, I got to thinking that if she loves it so much, maybe you guys would too! 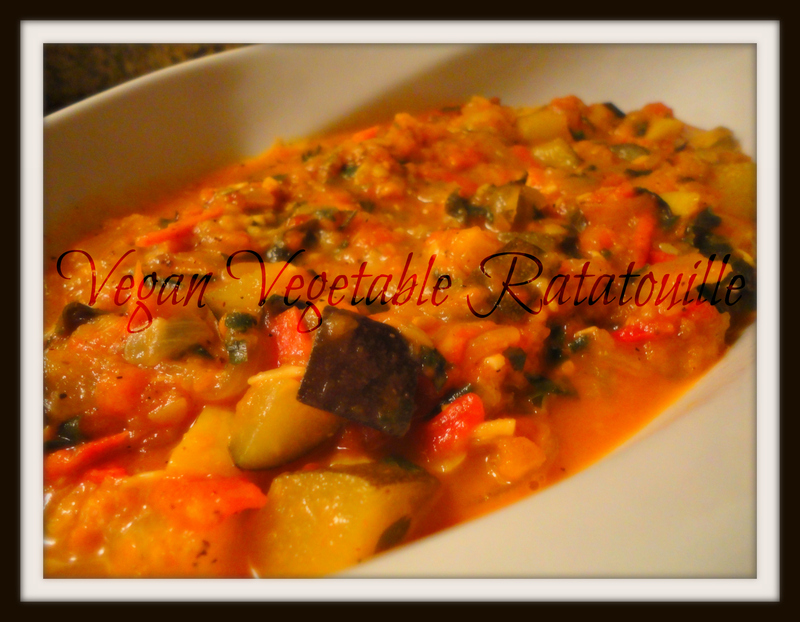 So here’s a vegan rendition of my ratatouille since there’s been some requests for more vegan dishes. I hope you enjoy. In a medium pot heat the olive oil on high. Once hot add the sliced onion and minced garlic, sprinkle with 1/2tsp of salt. Quickly toss the onion and garlic in the oil then reduce the heat to medium-low to allow them to sweat, cook for 3 minutes. Add the zucchini and yellow squash, as well as the remainder of the salt and the ground black pepper. Simmer uncovered for 10 minutes, stirring periodically. Increase the temperature to high, add the diced tomato and white wine. Simmer uncovered until the liquid has reduced by approximately one-third. Add the vegetable stock and stir well. Simmer on high for 5 more minutes then reduce the heat to medium-low. Cover the pot but leave the top slightly askew so some steam can escape to allow the liquids to reduce, simmer for 45 minutes, stirring periodically. Add the chopped parsley and basil, and continue to simmer while partially covered for an additional 15 minutes. Before serving taste the ratatouille to make sure it is seasoned to your taste. There you have it, you’re done! As I said, serve this as a sauce, a side, the main dish… whatever you want. Tags: garlic, onion, perfect pairings, perfect pairings at home, squash, tomato, vegan, vegetable ratatouille, vegetarian, zucchini. Bookmark the permalink. I will make this for Meatless Monday. A great time of year for this with all the fresh veggies around. I usually use eggplant in mine. Have I told you lately that I love you? I haven’t tried ratatouille since I was a kid and I used to hate it, but i recently tried zucchini again (at Val’s house) and I loved it. I am pinning and probably making this for dinner one night this week. I love finding awesome vegan recipes! !